With four kids, 3 vehicles and what seems like endless projects on the house and general fix-em’s, I need any help I can get. I seem to have this left/right brain struggle going on all the time as well. I am super organized when it comes to certain things, and others…well…it’s like an episode of “Hoarders”. 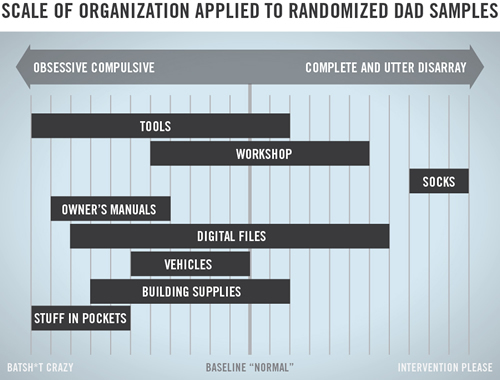 Truth is, I’m not always looking for things to get better organized. To me it seems most of the things that help you get organized take too much time and then stuff gets pigeon-holed away so you can’t find it. So my approach has been to either throw it away (or recycle), sell it, or concede to my right brain dominance and leave the organically-strewn pile of “things to file” right where it is. So my desk has this Dagwood-style-sandwich-stack of papers on it. And I seem to keep everything. Thank goodness for that, cause I had to rip my gas-powered blower apart the other day to replace some crumbling fuel lines. [mumbling to self] Hmmm. Manual…manual…uh…no, wait… here it izzz. No. WHERE’S THE MANUAL I KNOW I HAVE IT ONE OF YOU KIDS MUST HAVE TAKEN IT TO COLOR ON. Well, I do have every manual of everything I ever bought. Because they have cool isometric drawings of replacement parts that I know I can skip paying the a/c guy to change the fan motor starting capacitor or even replace the fuel lines on my blower and put it back together again. No problem. All day long. Everytime. Well, I found it. The box of tool manuals were in a plastic file container in my shop because I organized it before and therefore could not find them. Turns out the container didn’t seal so well and almost every printed page was stuck together or faded—no doubt from our mild, dry summers here in Florida. A quick search of the interwebs revealed a bunch of crappy forums, spam sites and the like. But I stumbled upon managemylife.com. 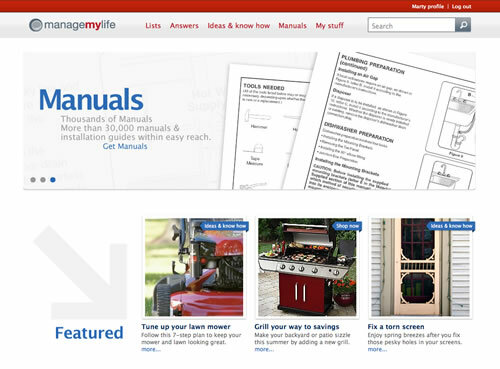 Managemylife.com has plenty of info about DIY stuff around the house— naturally most of it centered around products sold by Sears, but that’s okay, I’ll take some brand messaging with the abundance of free features they offer. Mostly, I use the “Profile” and “My Stuff” features. “My Profile” is fairly straightforward, just a way to tie “My Stuff” to me. There is a public profile, but mine is very limited. “My Stuff” is basically a catalog of stuff I have. 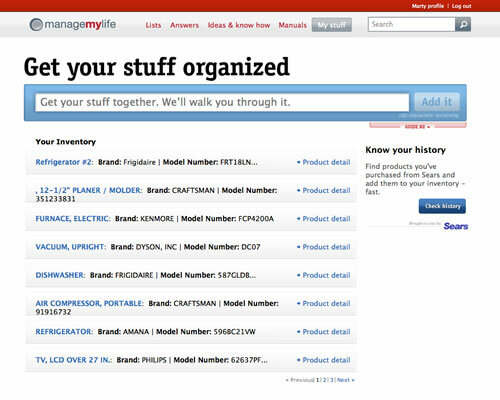 You can enter item type, model numbers, date purchased, cost and insurance info, etc. If you bought stuff at a Sears, there’s a tool to automatically add past purchases to your “stuff”. I found purchases that were about 10 years old. Yeah, I have two refrigerators. I can't keep them organized, but I can keep the manuals just a few clicks away. I also have a planer in there that I bought off some guy on craigslist. Now I have the manual for it and know what kind of knives to get. So they do keep that data on you. 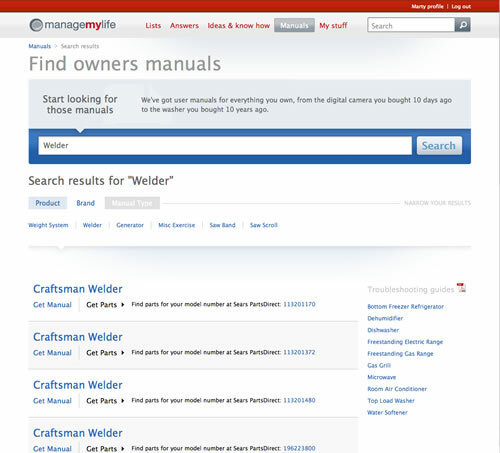 But the best part is you can search for owner’s manuals for just about any household tool or appliance—even stuff I didn’t buy at Sears. And you can connect the manual to your profile. Looky looky. All those manuals. Of all the searches, I couldn't locate manuals for only 2 or 3 items. I found manuals for items I bought at other retailers. Also, should I need some replacement parts, you can link right from your product to Sears PartsDirect to order them. Like the stupid leveling feet I needed for my fridge. So I can digitally organize my stuff, and their manuals and I have a good record for insurance purposes. Again, it’s free and I can easily get past the notion it’s one big vehicle to market and push some new appliance. Now only if this thing worked on organizing kids’ shoes. This is incredible and already a must do when I get home tonight. Like you, I tend to keep everything and every once in a while it gets completely organized only to make it all the more difficult to find later on. Sweet. This is a bit better than the file folder I have labeled “manuals”. Seriously, I have such a file and use it. Frank, I still have a whole file drawer dedicated to manuals I haven’t added yet, so I know exactly what you mean. Just a little at a time. This is a pretty cool tip. I have a box of manuals and other papers I think I might need one day, but I would love to get rid of that thing. This is the first time I have run across this blog. I will be back. Like this a lot! All busy parents need it! Sugru is very science-y, indeed.